Throughout the post you may see things grayed out. This was done because a portion of this occurred on a work machine… so I’m simply removing references to those machines/networks/etc. 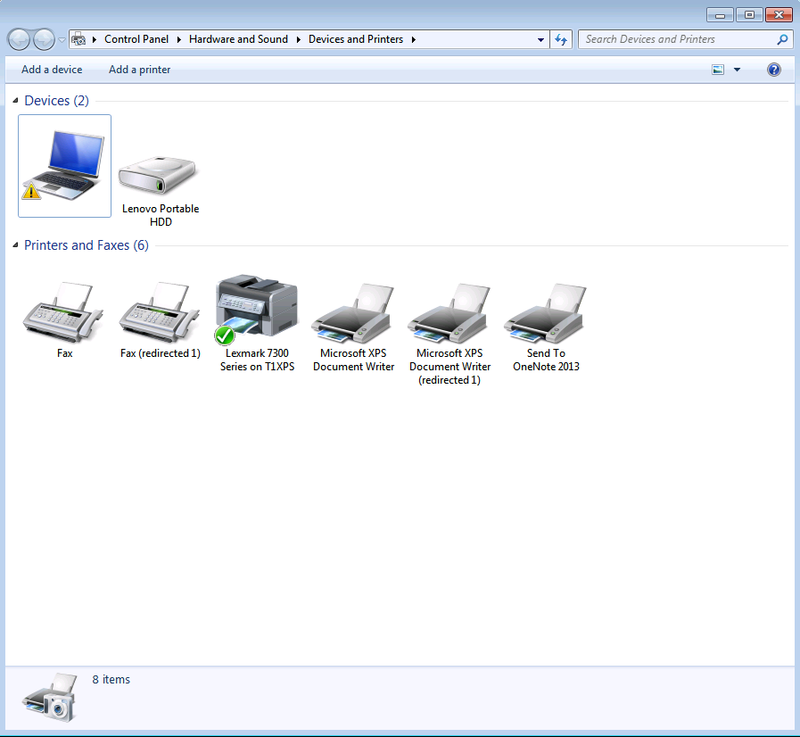 The printer was an HP Deskjet that was once running on my network and I wanted to remove it. If I attempted to delete it I’d get the dialog box above telling me that Access is denied, unable to remove device. I went about my business but after a while this got on my nerves and I scoured the web to find a way to resolve it. Sadly, most of the examples I were seeing were for registry changes and other were reporting it did not work for Windows 7 but that it had on Windows XP, which of course didn’t help my situation. After some searching though I figured out how to delete a printer from Windows 7 when it tells you that your access is denied. In order to fix the printer problem you’re doing go need to get to Print Management. You can get to this however you like (through the menus or whatever) but the fastest way is to just hit your Orb (the Start button) and type in ‘printmanagement.msc’, put your cursor on the item that shows up under Programs, right click and select Run as administrator. Windows 7 will launch Print Management and you’re off and running to resolving your printer issue. Once you are in Print Management you’ll see your printer listed. 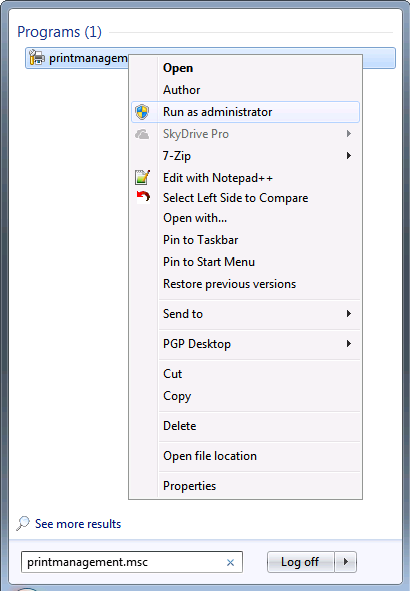 If you try to delete it you get the nasty Access is Denied, Unable to Remove Device dialog box. Right click on your printer and select ‘Properties’. 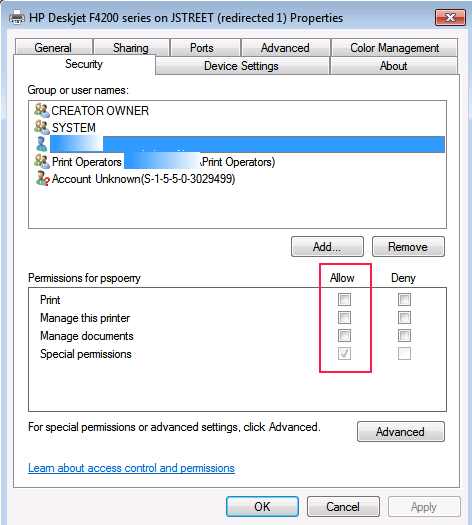 Once this displays you’ll see the problem… your printer is listed but your account (or a group you belong to) doesn’t have permissions to manage the printer. Go ahead and give yourself permission… check the checkboxes and then hit OK to save the settings. 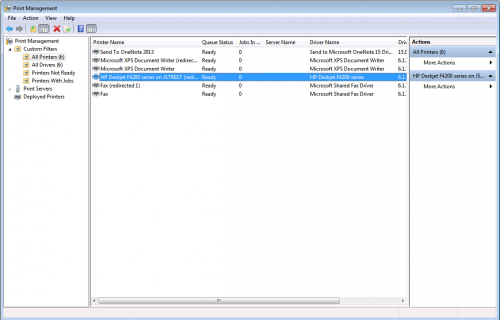 If your printer is highlighted just hit your delete key now, or right click it and then select delete and you’ll be prompted by Windows 7 to make sure you want to get rid of the printer. Click yes and you’ll be returned to Print Management and the printer will be gone. You can confirm that it’s been whacked by going to your control panel and looking under Devices and Printers (or taking the shortcut by hitting the Orb and just start typing ‘printer’ until you see that option and select it). On a side note… does anyone else think that’s a bizarre naming choice? Printers ARE devices… shouldn’t that section just be called “Devices”? Then again… considering printers always give me issues I guess it’s smart they flat out reference them in the control panel name. Once you’ve removed the printer you’ll happily see that it no longer displays in Devices and Printers and you’ve resolved your issue. 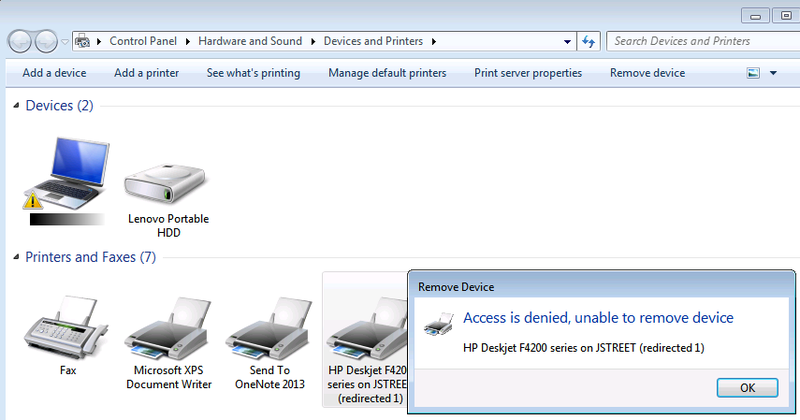 I am getting the “Access is denied, unable to remove device” when I try to remove the printer from the Devices and Printers window. However, when I open Print Management the offending printer is NOT dislayed. Any ideas? I have two printers that somehow got set up on a win 2008 R2 server. Each is labeled with (redirected #) tagged at end of name. 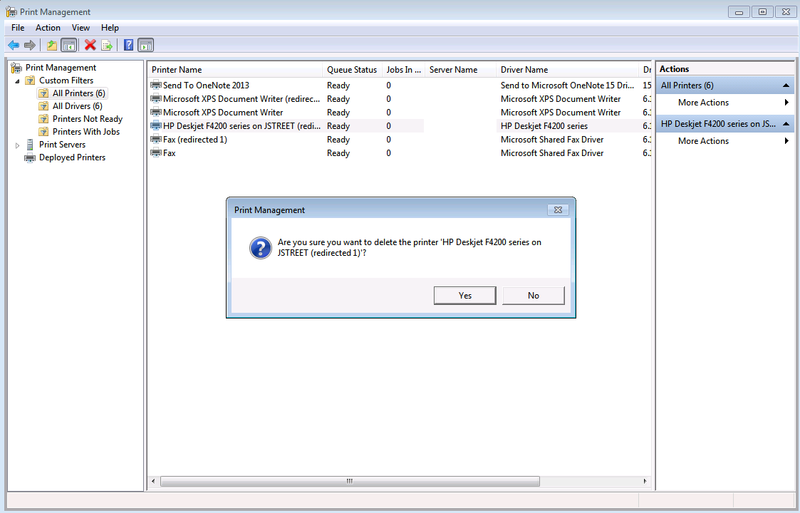 One of them let me edit properties, give permissions, then delete, in the printer management snap in. 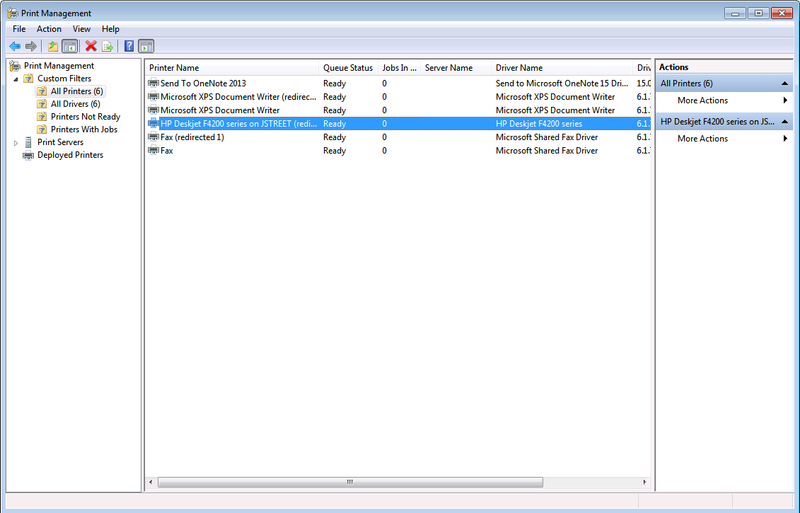 The other has permissions grayed out, and I have yet to figure out how to fix that so it can be deleted two. My real concern now is how these printers got set up. This is my public facing exposed web server, and Symantec is constantly cleaning up backdoor trojan php attacks. And in the HP registry keys, I found a reference to ‘San Diego IO’ key, which one security blog said was the result of some attack. I deleted those keys. 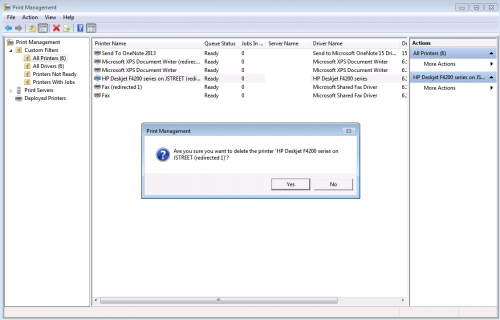 At any rate, I figured out how to install the Print Management feature on the server, it is not installed by default, and how to remove installed print drives using it. But had not drilled down to the area listing printers you pointed me to. That sounds horrible Ronald. Glad you got it figured out and that this helped!